01:30:00 Makes about 3 dozen cookies or 36 servings, 1 cookie each. Makes about 3 dozen cookies or 36 servings, 1 cookie each. 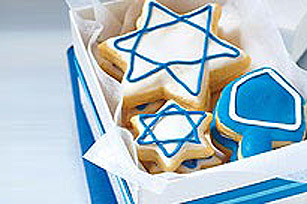 Celebrate the season with our Hanukkah Sugar Cookies. The cream cheese dough ensures sweet and tender cookies that are perfect for sharing. Preheat oven to 350°F. Beat cream cheese, butter, sugar and vanilla with electric mixer on medium speed until well blended. Add flour; mix well. Cover. Refrigerate 1 hour. Place dough on floured surface; roll out to 1/8-inch thickness. Cut out with your favourite festive 2-inch cookie cutters, rerolling dough scraps as necessary. Place, 2 inches apart, on ungreased baking sheets. Bake 12 to 15 minutes or until edges are lightly browned. Remove from baking sheet; cool on wire racks. Decorate as desired. Serving Size Makes about 3 dozen cookies or 36 servings, 1 cookie each.